North Carolina’s higher education system is storied. We are home to the country’s first public university and to some of the finest private liberal arts colleges in the nation. From midsize colleges to large internationally renowned research universities, these campuses touch the lives of students, businesses and communities across the state. They are producing the next generation of leaders, thinkers, and doers and are an integral part of our own individual stories. North Carolina’s higher education legacy, which stretches over two centuries, is a defining part of our state and her people. Nestled alongside oak covered quads, brick walkways, and colonnaded lecture halls, are the houses where leaders of these institutions, our state's University Presidents and Chancellors, live, work and call home. These homes are symbols of each school’s distinct character. They are colorful representations of history, tradition, and architectural design. For hundreds of years, university stakeholders -- students, faculty, administrators, donors and community members -- have come together through celebrations, meetings and receptions within these architectural jewels. You’ve likely walked and driven past them dozens of times, but you may have never entered. This week we invite you inside. The President of the UNC System, leader of 17 campuses across the state, resides in Chapel Hill on the campus of University of North Carolina. The original President’s home was built in 1812 and burned down on Christmas morning in 1886. The current President’s house, designed by Frank Milburn, was built in 1907. Milburn designed numerous buildings across North Carolina including 12 other UNC-Chapel Hill campus buildings including the Campus Y, Alumni Hall and Peabody Hall. The President’s House dining room walls are adorned with murals of iconic landmarks from UNC System schools. In August of 2014 while preparing to re-surface the home’s driveway, construction crews uncovered the remnants of what are thought to be the original nineteenth-century home’s foundation. Further excavation revealed broken pieces of china, pottery, and glass. The second chandelier to call the President's Residence home. According to Mrs. Susan Ross, wife of UNC System President Tom Ross, the first chandelier was broken while being lowered for cleaning. A 1906 Steinway Piano sits ready to entertain in the home's living room. Mural depicting UNC's Upper Quad. Other dining room murals depict iconic images from schools across the UNC system. Founded in 1887 and located in Raleigh, NC State is now the largest university in North Carolina. Located on Centennial Campus, The Point is the Chancellor's new home. Completed in 2011, The Point replaced the former Chancellor’s home on Oberlin Road. Designed by Marvin Malecha, Dean of NC State’s College of Design, the state of the art home was built using sustainable materials, locally sourced wood, and includes solar panels and geothermal heating and cooling. The ceiling in The Point's front entrance is sourced from a cypress tree grown in Hoffman Forest. Pops of Wolfpack Red can be found in every room of the house. The Point's kitchen won “Room of the Year” in The National Association of Home Builder's 2012 Best in American Living Awards. Located in Winston-Salem, Wake Forest University is one of the top private universities in the Southeast. The President’s home was originally built in 1929 for textile barons Ralph and Dewitt Hanes before it was donated to the University for use as the president’s residence in 1988. This house was designed by a famous New England architect, Julian Peabody, as a traditional Georgian Colonial style home. George Black, a local but nationally-known African-American brickmaker, handmade the bricks used on the house. These bricks were two and a half times the normal brick size. Ellen Biddle Shipman, one of America’s first female landscape artists, designed a garden for the home. 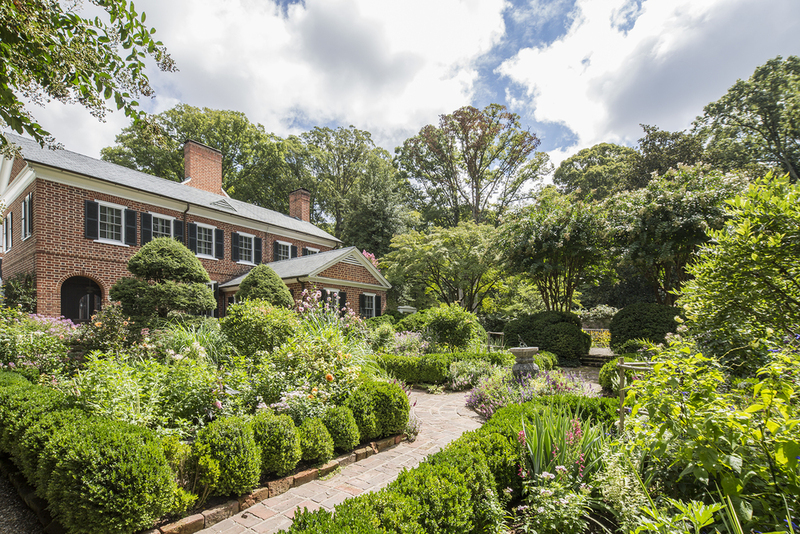 Shipman designed twenty-one gardens in North Carolina, including Sarah P. Duke Gardens at Duke University. While the interior of the Hanes house was renovated when it became the President’s House, the exterior has remained essentially unchanged since 1929. Original antique Russian glass prism chandelier. Niagara (c.1869), a notable painting by Albert Bierstadt, anchors the room, and is a premier work from the University's Simmons Collection. 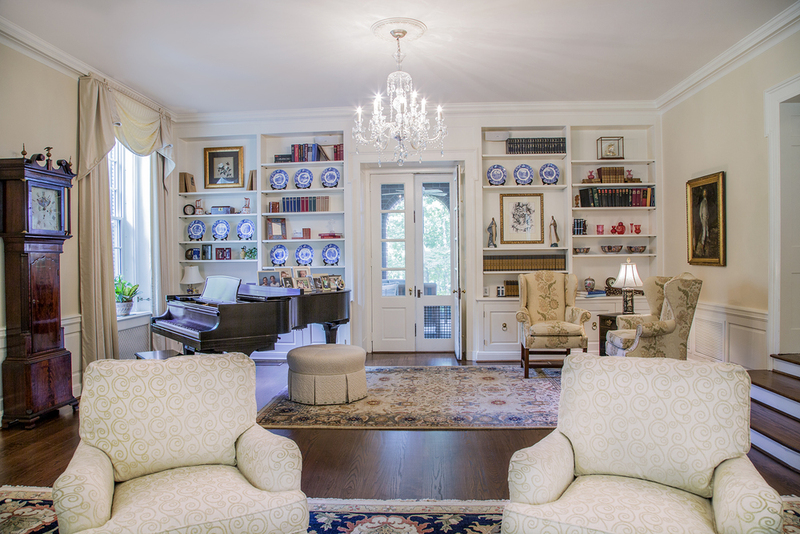 The living room's chandelier once hung in the first President's house on the Reynolda Campus, built in the 1950s. Much of the dining room is original including the wallpaper with its silk-screened scenes that contrast the bright cobalt chalked background. Dusky Duck (1859), a Chromolithograph by American naturalist John James Audubon, sits above the original blue tile framed fireplace. Signature statements of landscape architect Ellen Biddle Shipman's style pepper the garden including: a Chippendale gate, dovecote, garden furniture, and privacy walls that don't compromise the natural setting. East Carolina University, the third largest research university in the UNC System, is located in Greenville. The Chancellor’s home -- an Italianate two-story home flanked by one-story wings on the east, west, and north -- was designed by architect and Raleigh native, Murray Nelson. Fully completed in 1930, the first owner of the house, Haywood Dial, Jr., ran the city’s only brick-making company. He was a staunch advocate for bringing the college to Greenville and his company supplied all the bricks for its new campus. After financial difficulty, the Dial’s were forced to sell the property in 1933. 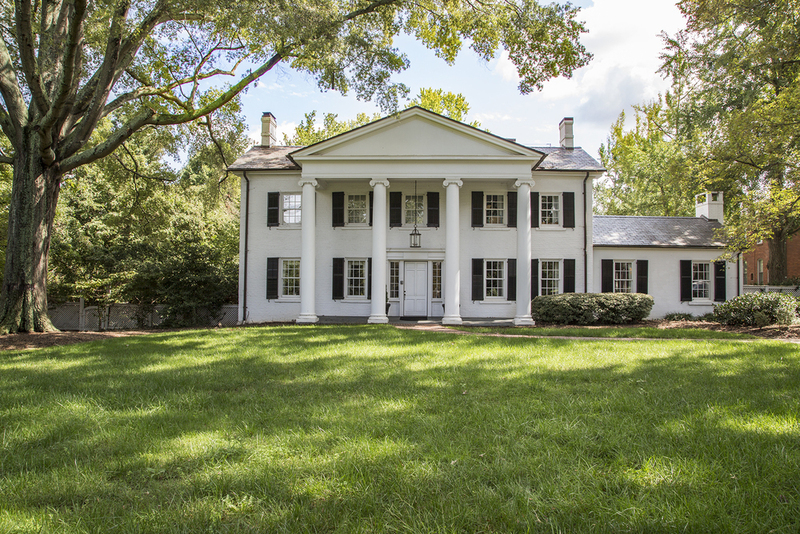 The Young’s purchased the home in 1937 and called the residence home until the home was purchased by East Carolina Teachers College in 1947 for $30,000. 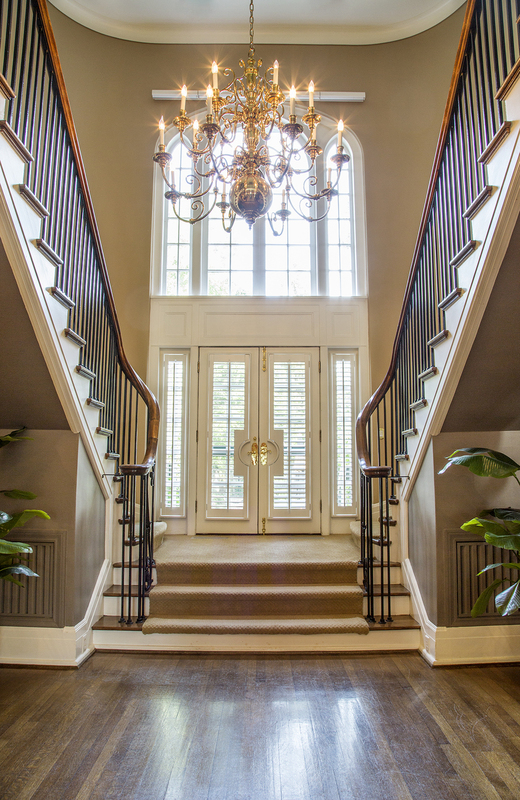 A Goldsboro artisan hand-carved the curved wooden banister rail on the double staircase, a feature proposed by wife of the original owner Mrs. Dail. The mantel was handmade by Griffin Lumber Company of Goldsboro. A portrait of Haywood Dail, the first owner of the home, hangs above the fireplace. Dail was a huge advocate for bringing what was then East Carolina Teaching College to Greenville. Legend has it that he ate non-Greenville ballots at the poll that decided the college's new home. It worked. This story is often called the "Dail Legend." 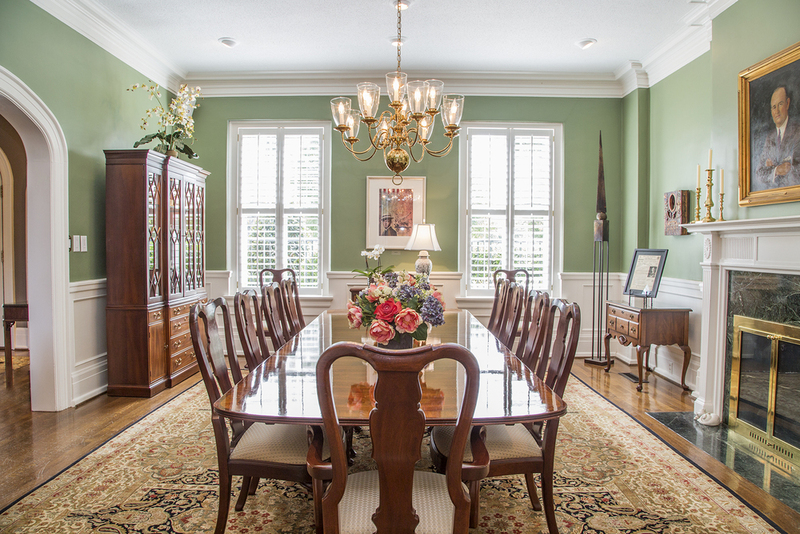 Every piece of art in the home was purchased or donated from ECU's art students and faculty. Established in 1837 by the Concord Presbyterians of North Carolina, Davidson College is one of the nation’s top liberal arts colleges. The present day President’s House is an original construction built in 1836-37 for the school’s first President. In 1860, the simple original two-story home underwent expansion and has seen various superficial renovations through the years. Through each phase of renovation, designers have sought to preserve the home’s architectural and historical integrity. Phil/Spitbite, a piece by Chuck Close, hangs above the fireplace. A painting (left) by Douglas Houchens, the founder of Davidson College's art department, hangs next to an original Roy Lichtenstein. Hans Hoffmann's, 'Untitled', Gouache on paper, draws the eye in the dining room. The sunroom, pictured here before an event, is often used to host receptions and gatherings.